With the July 4th weekend starting, it is hard to think of anything aside from spending time outside in the sun. Wednesdaym the boys and I went to the park with Nana and had a lot of fun on the cool summer day. What is your favorite thing to do when you go to the park? Remember, not only kids like to swing – so fess up! Oh and if you have kids in school, please stop by and answer my School Supply List question that I asked yesterday. I posted the list that my son has for second grade and was curious what others have for the fall (must be the teacher in me). Great pictures! As usual. I do like to swing, actually. I probably always will. I love the walk around and sometimes those swings do invite me for a swing,lol. I love the Sand boxes, always have. of course the beach is better but the sandboxes are the next best thing! These days, I’m just walking the trails with a friend or my dogs. My kids are older so we don’t go to the park very often. But, they love to climb and hang on the monkey bars. 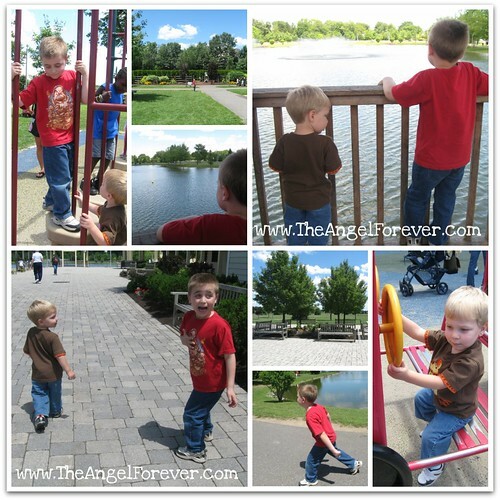 Its been a while since I took my boys to the park, my baby being 24 yrs old, but my favorite if I can remember that far back (lol) would be the swings. A good game of tag is always fun. I love to get on the swings! I love to swing and run around the park with my girls. I love to swing, have since I can remember. Fishing is fun, too, if the park has it available. I love the teeter-totter, though I have been told those are too dangerous now and they have all but disappeared from our parks. Now they have a spring-type contraptions where if you go back and forth too hard I think you can bash your head against the ground. Lol Go figure! 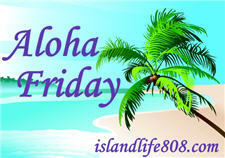 Thanks for the Aloha Friday comment! We usually only go to the park for b-days or events like craft fairs/4th of july type of things. Otherwise in the summer we’re in our pool. My littlest niece loves the swings especially when I puch her high and run underneath, whereas my littlest nephew loves slides – the bigger the better! I’m afraid to use the swing…seems it will throw me off. I do chase the kids around though. they love it. And sometimes I read and watch them. I’m fessing up. My favorite thing is to swing! The park in my neighborhood has that soft, colorful, recycled tire surface. I’m embarrassed to admit that in my old(er) age, my favorite thing to do at the park is to walk around on the squishy surface. How lame is that!? !